The Antique Tent has become one of our most popular stops. Treasure hunters can browse through donated paintings, furniture, toys, primitives, glassware and more. The Society accepts most antiques or collectibles all year, and the market value of donations is fully tax-deductible. Many donors prefer giving items to the Society versus the time, expense and privacy concerns of a garage sale. 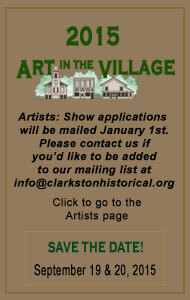 To donate, please contact info@clarkstonhistorical.org or call 248-922-0270.